"This is a recipe for a low-carb, gluten-free bread, also known as 'cloud bread,' which is a great base for sandwiches or pizza. 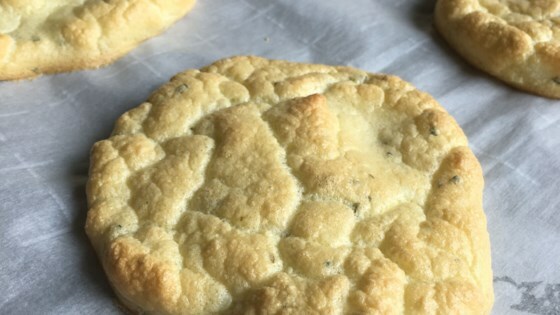 In this recipe, the cloud breads are flavored with Italian herbs." Preheat the oven to 300 degrees F (150 degrees C). Line a baking sheet with parchment paper. Beat egg whites in a glass, metal, or ceramic bowl until foamy. Add baking powder and continue to beat until stiff peaks form. Whisk egg yolks, cream cheese, Italian herbs, and salt in a separate bowl until well blended. Gently fold cream cheese mixture into the beaten egg whites with a spatula until just mixed and yellow. Spoon mixture into about 6 rounds of about 3 inches diameter on the baking sheet. Smooth the tops with the back of a spoon. Bake in the preheated oven until golden brown, about 25 minutes. Remove from the oven and serve warm, or allow to cool.